I have exciting news today! My good friend Jamie of the blog Nails Adored has worked her magic on my blog again and totally blew my mind with how awesome it looks! On top of that, my blog is now located at it's own domain! I finally took the plunge and secured http://www.polishfixation.com ! Click that link to take a look at the new layout if you are viewing this in a reader, Jamie's work is amazing! To celebrate the new domain and new layout, I did a splatter mani inspired by a few of the colors in the new color scheme! I love how this splatter came out! 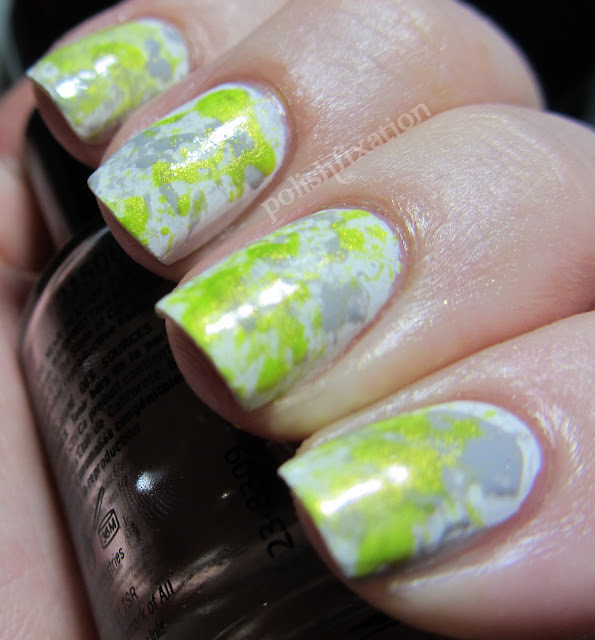 I used a white base color and then splattered with KleanColor Melon Green and Maybelline Audacious Asphalt from the new Color Show polish line. What do you think of this splatter? Also, do you like the new layout? Check out Jamie's Blog Nails Adored if you haven't had a chance yet! The layout looks really good. I love the colour combination, very summer-retro-esque. (LOL) The mani is superbe. I'm going to have to try this technique soon! Love the new layout and your mani is awesome! They both look great! Love it! I love these colors together! Fantastic mani and fantastic layout! This looks all kinds of awesome! Gorgeous. & I love the new layout, I may have to take some tips from this!